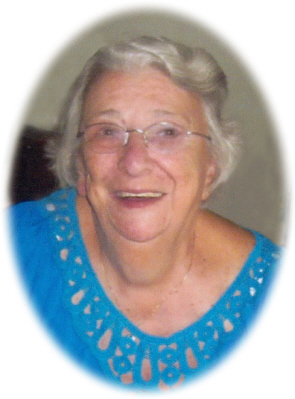 Charlotte Audrey Kirin, age 88, of Dewitt, MI, passed away Friday, March 22, 2019, at Sparrow Hospital, Lansing, MI. A Memorial Mass will be held at STS Peter & Paul Catholic Church, 421 Covington Street, Youngstown, OH on Saturday, April 13, 2019 at 9:00 A.M.
Audrey was born in Youngstown, OH on August 21, 1930, the daughter of George Monroe and Laura (McMahon) Bailey. On May 29, 1954, Audrey married Steven Michael Kirin at STS Peter & Paul Catholic Church. Steve passed away February 18, 1995. During WWII, Audrey worked for Packard Electric then worked for Northside Hospital in Youngstown, OH for 30 years as a Nursing Coordinator. Audrey was a member of STS Peter & Paul Catholic Church, St. George Croatian Club Lodge #66, and the American Croatian Citizen Club (ACC) of Youngstown, OH. Audrey loved the Croatian Culture and was very proud of her Croatian heritage. She enjoyed oil painting and spending time with family and friends. Audrey was especially fond of playing BINGO at The Senior Center in St. Johns, MI. Audrey is survived by her daughter Mary Ann Santistevan of Dewitt, MI and son Michael Kirin of Nampa, ID. She is also survived by 2 granddaughters: Adeline (Brandon) Wharton, and Harley Kirin; and 4 great grandchildren: Steven, Mariah, William, and Ava. Audrey was preceded in death by her parents; husband Steve "Chicky" (1995); grandson Edward Anthony Santistevan (2005); and her brother Harold Bailey (2012). In lieu of flowers, the family requests that donations be made to the Cardinal Mooney Catholic School for a Scholarship Fund in memory of Audrey Kirin, 2545 Erie St., Youngstown, OH 44507 or www.support.CardinalMooney.com. Online condolences can be sent at www.smithfamilyfuneralhomes.com. The family is being served by Smith Family Funeral Homes - Osgood Chapel, St. Johns, MI.